(Hebrews 9:13-14) For if the blood of bulls and goats and the ashes of a heifer, sprinkling the unclean, sanctifies for the purifying of the flesh, how much more shall the blood of Christ, who through the eternal Spirit offered Himself without spot to God, cleanse your conscience from dead works to serve the living God? CONSCIENCE is an interesting word, one with multiple and varying definitions, depending on who is defining it. My hope is that you, like me, are primarily interested in God’s definition of the word, since He is the reason we have conscience in the first place. 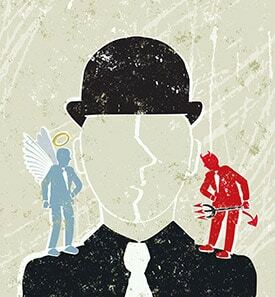 Contrary to the popular image concerning conscience, with an angel on one shoulder and a devil on the other, conscience is more than a conflict of soul between right and wrong. The word “conscience” (sunidesis in Greek) is used in the New Testament several times, and reveals foundational truth concerning how humans are constituted. The word itself means “a co-perception or knowing with, or co-knowledge with one’s self”. In simplicity “conscience is how we know our true self, even transcending our fallen state, to before we knew sin. It is for this reason conscience is associated with the innate human ability to know and perceive right from wrong, apart from taught family or societal norms. An illustration may help us understand. Recall, if you will, being a child. Remember a time when you were caught in between a choice. No one was around, and you wanted to do something, yet inwardly there was a warning telling you that you were about to make a wrong choice. That inward warning or system of boundaries is your “conscience”. That inward warning, in the singular event of our illustration, did not come from anything you were instructed in from family or community. Hence your innate and God created conscience was your guide. My wife and I having five children of varying ages, have witnessed their struggle, as they wrestled with their “conscience” many times over the years. More than a few times I have peered around a corner to observe them struck still, as they decide whether to do a particular thing they have been taught to stay clear of. In this example two things must be considered. 1) Conscience in and of itself is not enough to keep us from sin. We can see this in Adam, considering he knew what he was doing was wrong, as the scripture calls his sin “transgression” (II Timothy 2:14) or rebellion against a known standard. 2) A conscience weakened by the sin nature can be bolstered by the boundaries of a relatively moral environment. Although my children’s conscience is less sensitive, through inborn iniquity, it has been enhanced by the moral boundaries of their parents. Sometimes they have chosen to regard their conscience, sometimes they have not, but the fact remains that their dilemma reveals that all humans have a conscience given by God. It is for this reason we understand that the co-perception or co-knowledge with oneself, is knowledge of oneself as God intended us to be; righteous and holy as He is. Remember humanity was created in the image of God (Genesis 1:26), and although after the fall Adam brought forth his sons in his image (which is sown throughout with iniquity), God’s image is still present. Conscience is God’s moral and righteous stamp upon the soul of all men. From where does this stamp come forth? Quite amazingly, this moral imprimatur comes from Jesus Himself. In John 1:1- 5 we are introduced to Jesus our Savior, as the eternal Word of God. In verses 1-5 we see Him not only as the word of God and God Himself, but we see Him as the principle figure of the Godhead in creation. We also see Him as having the principle of life within Himself and “this life is the light of all men”. A short time later, in John 1:9, we read Jesus as the “Light” of the world “gives light to every man coming into the world”. We understand the light is a revealer, and in our pro-creation it is Christ that endows us with “conscience”, as a revealer of who we are created to be. In essence our conscience is to give us our identity as a “living soul”. Is it any wonder that in a fallen world, the frenetic nature of life, is really a search of man’s true identity? It is for this reason that countless souls gaining wealth, or pleasure or a supposed purpose, or family, or whatever, still find themselves unsatisfied and searching to assuage the gnawing hunger within their soul. Apart from Christ, their souls will gnaw with that hunger from now through eternity, for without faith and repentance in Christ, a man can only know himself as separated from God; hopelessly bound to be separated from God’s love and their true purpose. Our conscience is not merely a gauge of right and wrong or knowing ourselves as God intended, but the inward faculty by which men can know God. It is for this reason that men are without excuse before the Holy God, for all men have been lighted with the light of conscience, that they may have the opportunity to know God through faith and repentance in Christ (Romans 1:18-23). It is for this reason that pronouncing a person as “having no conscience” is simply foolish talk. With compassion we must understand that our “conscience” was weakened in the fall. We must also acknowledge that the circumstances and environment of our upbringing and life can either encourage or discourage more sensitivity to conscience. It is for this reason we marvel at the suffering in the world, as scores of men and women defile themselves as brute beasts, and savage the image of God in others. As we can clearly see, apart from Christ, conscience cannot lead to salvation. As a matter of fact apart from Christ, our conscience dirtied by “dead works” will lead us further from Him. This is what we will discuss next time. May God bless you as you consider the wonder of “conscience”, and how fearfully and wonderfully endowed we have been, by our Creator. This entry was posted in Christianity, cleansed conscience, conscience, dead woorks, discipleship, God's love, God's Word, Hebrews 9:13-14, holiness, Uncategorized. Bookmark the permalink. A good article and certainly one with food for thought. I’m sure there are as many interpretations as there are people, but, simply, I think conscience is our own inner voice telling us if something is right or wrong. If a person does something evil and feels no remorse, we say he or she has “no conscience”. But, it is their own inner being that sees no sin in what they have done. If you have any feelings of guilt it is because your own mind is telling you that what you have done is wrong. I think parents play a big role in teaching right and wrong, good and evil, acceptable and non-acceptable behavior. I don’t think enough of that is done today and children are raised with the belief that their actions are right; the actions of others (teachers, others in authority) are wrong. I would like to see an awakening to true Christian beliefs and understanding, It would benefit us all and the world would be a better place.